Many people liked the mesh upper of the Adidas Alphabounce Parley, which was made using recycled plastic. The aesthetics of this running shoe were lauded for being eye-catching. ‘Comfortable’ was a word that was frequently used to describe consumers’ experiences with this product. Appreciation was given to the underfoot cushioning system for being dutifully responsive. The price for a pair of Alphabounce Parley shoes was mostly deemed to be affordable. The sizing scheme agreed with the expectations of many runners. A couple of users mentioned that the shoe is too bulky for a running shoe. The Adidas Alphabounce Parley received acclaim from runners and other shoe enthusiasts. This road shoe was welcomed because of its appealing design, comfortable construction, and environment-friendly materials. It’s perceived to be an agreeable choice for neutral pronators who want to take to the roads. Parley Ocean Plastic™ is a revolutionary material that has a purpose that’s true to its name: to reduce plastic buildup in the earth’s most immense body of water. The result of this recycling process is a mesh upper that resembles woven cloth. The midsole unit of the Adidas Alphabounce Parley features a full-length foam that is springy. It is also responsible for attenuating impact shock. A full rubber outsole protects the rest of the platform from wear and tear. Spherical nubs heighten traction over the surfaces. The Adidas Alphabounce Parley was designed using the standard measurements. It accommodates the regular preferences of consumers when it comes to length. The women’s version features the B – Medium width profile while the one for men has the D – Medium option. The semi-curved shape of this running shoe mimics the natural curvature of the human foot. Adiwear is the material that’s used for the outsole of the Adidas Alphabounce Parley. This layer of rubber runs the entire length of the platform, shielding it from wear and tear. It is also responsible for doling out surface traction. 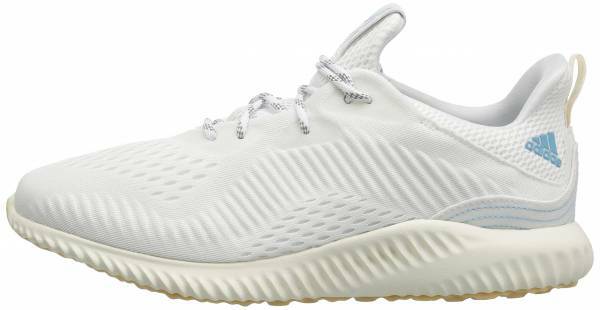 The same technology is utilized in the original Adidas Alphabounce, as well. Rounded nubs are patterned on the contact points. These protrusions heighten surface grip and underfoot support. The external pad isn’t inflexible. It’s designed to accommodate the natural movement capacity of the foot, giving more space to bend as it goes through the gait cycle. The midsole unit uses the Bounce cushioning technology, which is a full-length foam that carries the foot throughout the running session. It is responsible for attenuating the impact forces during the landing phase and giving a springy toe-off. The comfort level provided by the Bounce cushioning allows for problem-free daily runs. Forgedmesh is a cloth-like material that serves the Adidas Alphabounce Parley’s main upper façade. It has a closed construction for durability, yet it features a bevy of ventilation pores on the front and sides for breathability. Parley for the Oceans, a cooperative effort that converts plastics into sustainable components, configured some of the yarn that’s used in the making of the Forgedmesh upper. One of these environmentally friendly materials is the Parley Ocean Plastic™. It has the look and structure of regular yarn but entirely made of recycled plastic. A soft interior construction with a seamless design allows the foot to be free of hot spots and skin irritation. Such an in-shoe experience is a catalyst for the prevention of blisters and other injuries. One can even wear the Alphabounce Parley without socks.